The University of Georgia caught the attention of the college football world this weekend after almost taking down the No. 1 team in the country. The Dawgs had an impressive performance against the Alabama Crimson Tide and led the Tide until the fourth quarter. After quarterback Tua Tagovailoa suffered an ankle injury, Jalen Hurts stepped in and helped the Tide claim victory. Several college football experts argued that Georgia should still make the playoffs, despite their loss in the SEC Championship. However, the Dawgs ended up No. 5 in the country after the Top 25 rankings were released. The season, however, isn’t over for the Bulldogs. Georgia will take on the No. 15 Texas Longhorns on Jan. 1, 2019 at 8:45 p.m. in the Mercedes-Benz Superdome in New Orleans. To break down the matchup, we’ll look at several factors: record, offensive and defensive stats and a quarterback comparison. The No. 5-ranked Georgia Bulldogs only had two losses this season. Their first loss was to LSU on the road in Tiger Stadium. The Dawgs were undefeated in the SEC East and at home. The No. 15 Texas Longhorns suffered losses at Maryland and at Oklahoma State, with only one loss at home to West Virginia. The Longhorns took on and defeated the Oklahoma Sooners during the regular season, but they fell short in the rematch in the Big 12 Championship. Georgia is ranked No. 9 in total offense in the country. Texas is ranked No. 33. 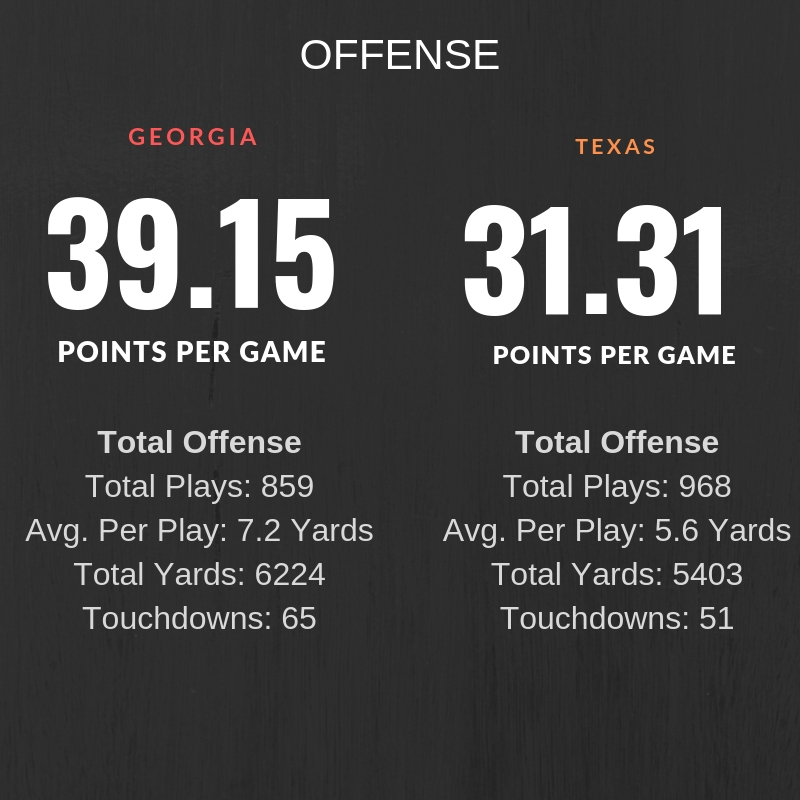 Georgia has allowed fewer points per game, on average, compared to Texas. Georgia is ranked No. 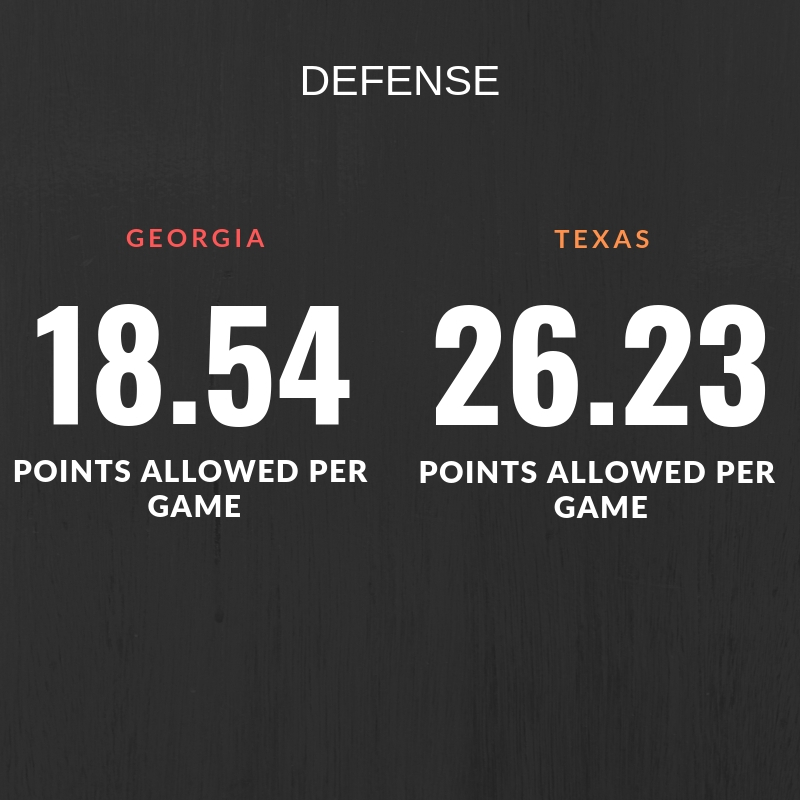 6 for total defense in the SEC. Texas is ranked No. 3 for total defense in the Big 12. 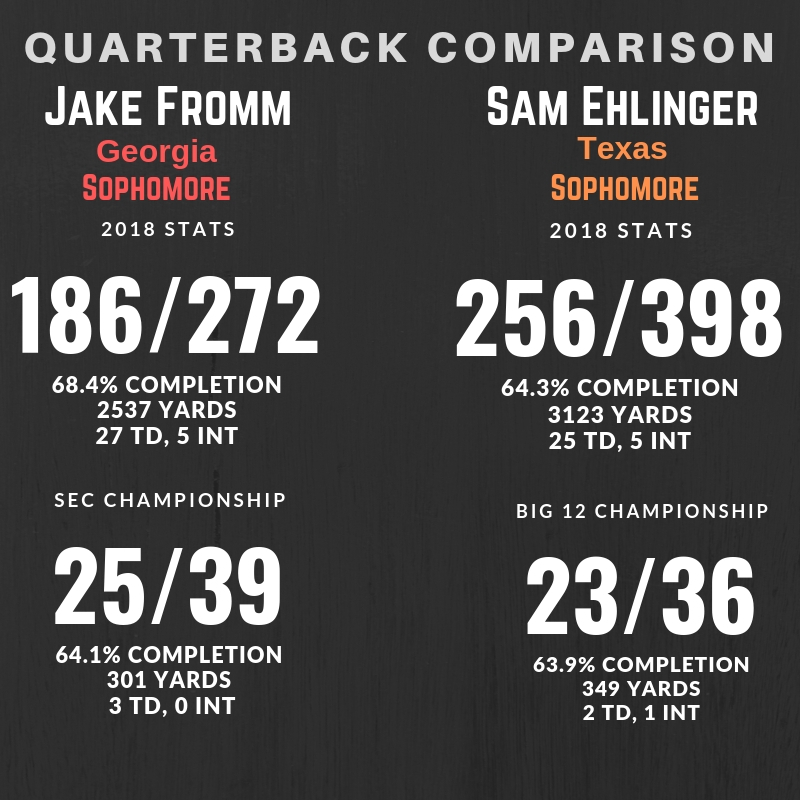 Both Jake Fromm and Sam Ehlinger are young quarterbacks who have over 60 percent completion this year. Both quarterbacks have thrown five interceptions this season. The last time the Georgia Bulldogs played in the Sugar Bowl was 10 years ago. 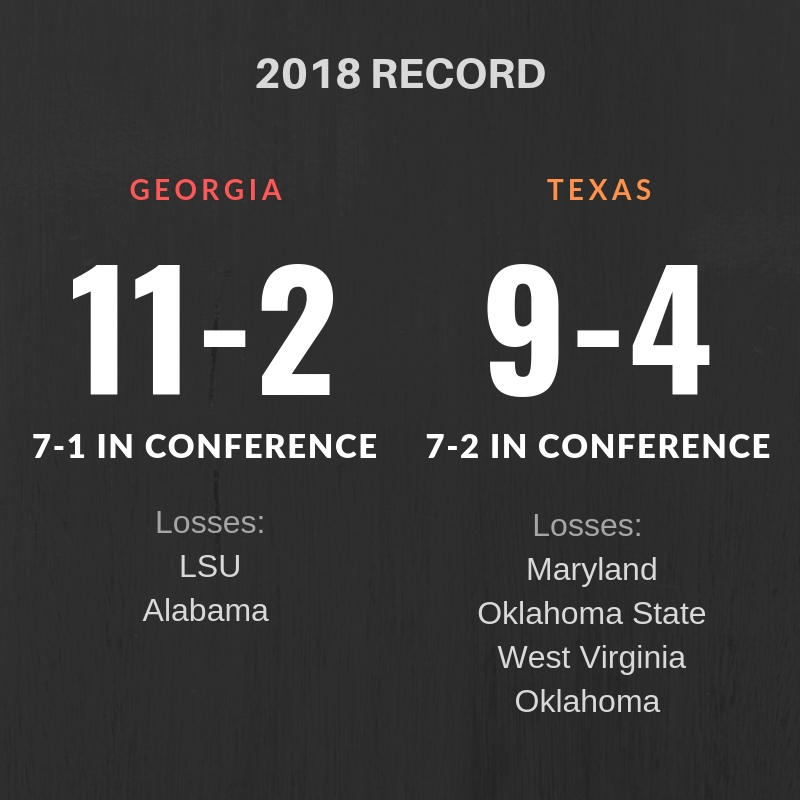 The Dawgs have not played the Texas Longhorns since 1984, but the two teams have scheduled a home-and-home series in the regular seasons of 2028 and 2029. Alyssa Alves is a senior majoring in journalism at the Grady College of Journalism and Mass Communication at the University of Georgia.